Remy could really use a loving home. His owner has Alzheimer, and he is blind from cataracts. But, it doesn’t stop him. This 7-year-old cutie adapts quickly to his environment, and is a laid back lap lover. He’s friendly and does well with other dogs. 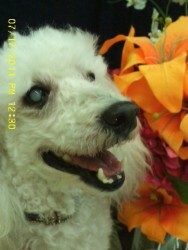 Remy is at the Oklahoma Orphaned Poodle Services, Tulsa, Okla. Learn more about Remy on his Petfinder’s profile, and check out the full gallery of pets who are considered less adoptable.